Suncraft Bamboo knives blend the best of Eastern and Western culture, styles, and materials. 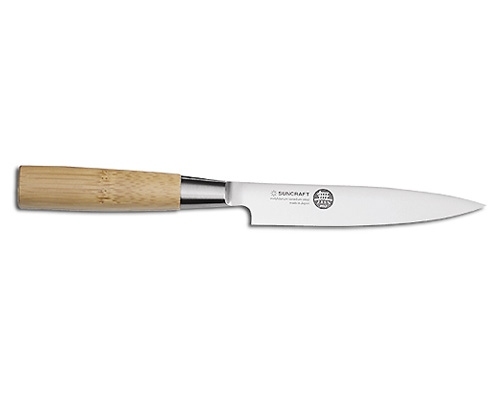 These knives have Eastern shaped handles that are ergonomically designed and and made of carbonized bamboo. These handles are then attached to a high-carbon molybdenum-vanadium, stainless alloy blade that has been tempered to 59 HRC on the Rockwell Hardness Scale, and then honed to a razor-like sharpness. This series of knives brings together the best of Eastern knife shapes (usuba, deba and yanagi) and Western knife shapes (chef knife, paring knife, and serrated bread knife). 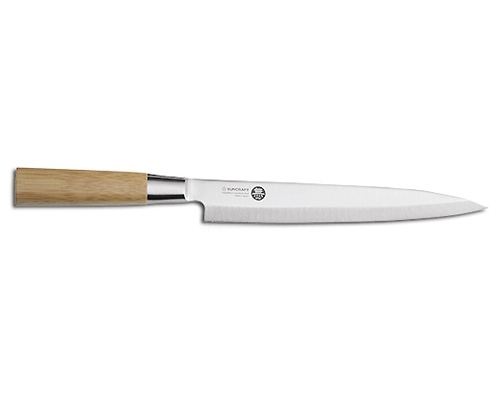 Suncraft Bamboo knives come highly recommended by Master Sharpener Charlie Robertson and Chef Pietro Leeman, founder of the successful restaurant Joia in Milan, Italy. The Suncraft Bamboo 4.5 in. 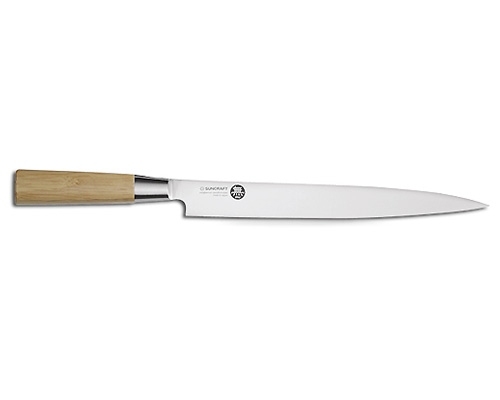 (110mm) Paring Knife is ideal for paring, peeling, and trimming small fruits and vegetables in your hand. The Suncraft Bamboo Series is a high quality Molybdenum Vanadium Japanese steel with Bamboo handle. 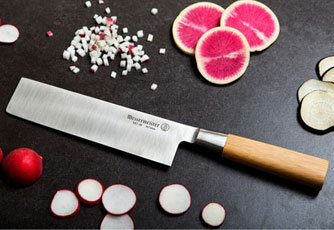 Suncraft Bamboo knives are a blend of East meets West and combine the best of both cultures. The Suncraft Bamboo 6.5 in. 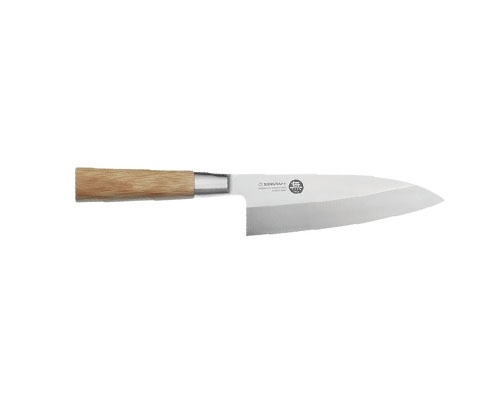 (165mm) Deba is a wide, heavy and wedge shaped knife with a sloping curve to the tip, and appears to be a cross between a chef's knife and a cleaver. This deba is most commonly used to separate meat from the bone, cut the bone, scrape off scales, and cut off heads from fish. The Suncraft Bamboo 8.5 in. 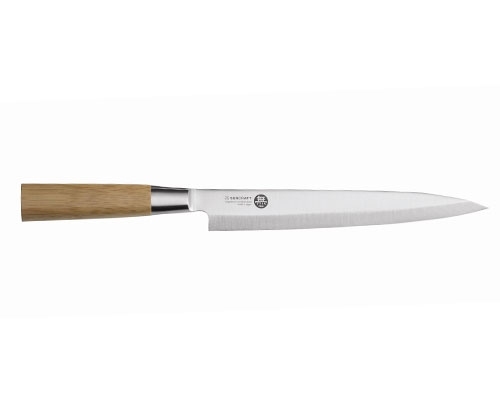 (216mm) Yanagi is great for slicing and cutting fish, meat and poultry. The Suncraft Bamboo 9.8 in. (250mm) Slicer Knife is for sashimi as well as for slicing the holiday turkey, chickens, and hams.